To prevent stagnation, work on the eight-metre wide canal, which will cover a distance of 18 km, has already begun near Koyambedu. CHENNAI:After many initiatives to restore the severely-polluted Cooum river back to its days of glory, work on building a baby canal in the middle of the river has now begun. The move is expected to prevent stagnation and other related trouble and ensure the smooth flow of water in the river. The eight-metre wide canal will run from Parathipett Anaicut in Padi Kuppam to Chetpet, covering a distance of about 18 kilometres, as part of the Integrated Cooum River Eco-Restoration Plan. 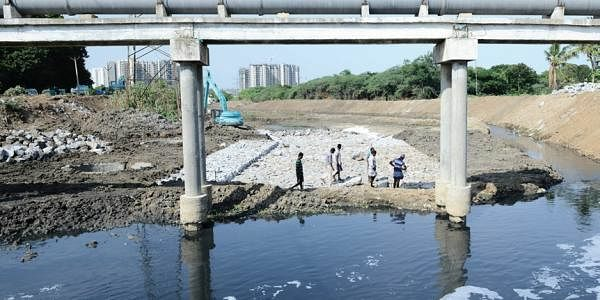 Work on the baby canal is in full swing near Koyambedu, where heavy machinery has been pressed into service to clean up the river and its banks on this stretch. The flow of the river has been altered and reduced to a small channel on one side for the work to begin properly. The waste and sludge have been cleared from the river bed, paving it with stones. The bunds, too, will be lined with boulders. “At present, we are just giving shape to a model of the baby canal,” said a Public Works Department official. As part of the series of smaller projects that make up the integrated eco-restoration plan, the Chennai Metro Water will construct about four to six smaller sewage treatment plants along the banks. They will treat raw sewage before releasing it into the river. For most part of the year, the flow in Cooum is mainly due to the discharge of treated, partially treated and untreated sewage through outfalls, which result in accumulation of sludge and formation of sandbars at the mouth of the river. Work includes creating bunds on both sides. “This would soon be converted into a lawn and walkway by the Chennai Corporation,” the official added. Other components of the work would progress after the families are evicted from the banks of the river, he said, adding that the work to desilt the river and lay the entire stretch of baby canal would take more than a year. The biometric survey to enumerate over 14,200 families living along the banks between Parathipett Anaicut to Chetpet is nearly over. “They would b evicted and resettled within the next few months,” the official said. For now, the plan is to lay the canal till Chetpet. He also pointed out that to take up work beyond that, the departments have to obtain Coastal Regulation Zone clearance.